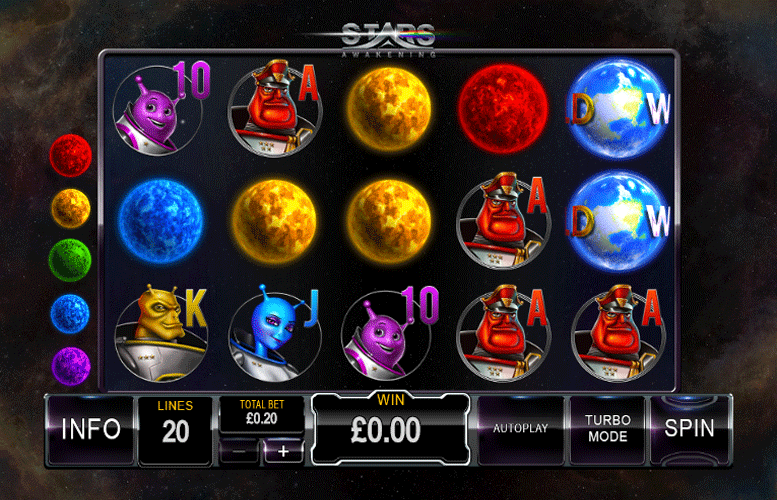 The Stars Awakening slot from Playtech is a colourful foray through the realms of deep space. There are aliens, bizarre planets, and some innovative bonus features. Unfortunately, understanding these features takes a bit of time. When you finally do get your head round them, you’ll be wondering whether or not it was worth it. They’re just not that exciting. However, thanks to its large upper betting limit, Stars Awakening is a good one for the highest rollers. If you’ve an oversized bankroll and a passion for space travel and extra terrestrials, maybe this game will be a good one for you. Cool look and feel. The space theme is well-delivered and there are plenty of bright colours, as well as an ethereal soundtrack of bizarre, out of this world noises. High upper betting limit. This makes Stars Awakening ideal for those who want to spend big bucks on a slot machine. Kind of confusing to play. The bonuses are a little convoluted and fully understanding them takes time and is ultimately not that rewarding. Lack of second screen bonus stage. This limits the replay value of the game. Lazy high value symbol design. They’re just coloured circles, after all. Red Planet = 500x the line bet. Yellow Planet = 300x the line bet. Green, Blue, or Purple Planet = 100x the line bet. 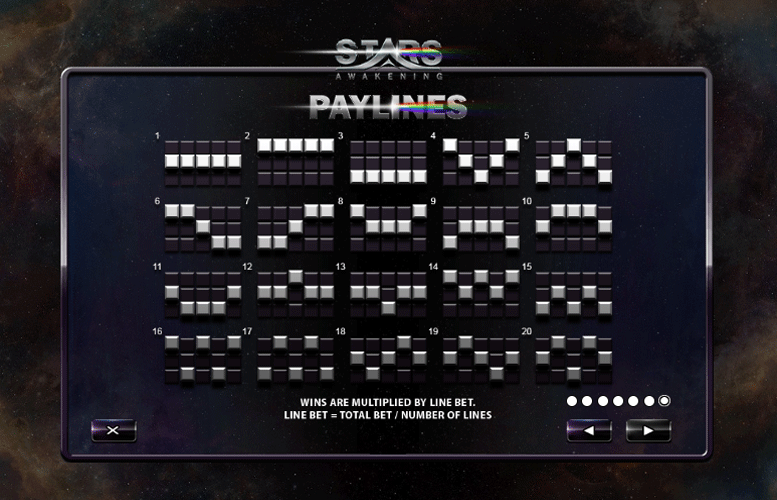 Players can land giant planets on the reels to drop huge five-of-a-kind wins. These enormous planets appear on reels 3, 4, and 5. They can land on any main game spin too. Level One = A winning spin will award a re-spin. During this re-spin, the purple planet symbol is replaced by the “scatter” symbol. Level Two = If the level one re-spin lands a win then another re-spin is awarded. 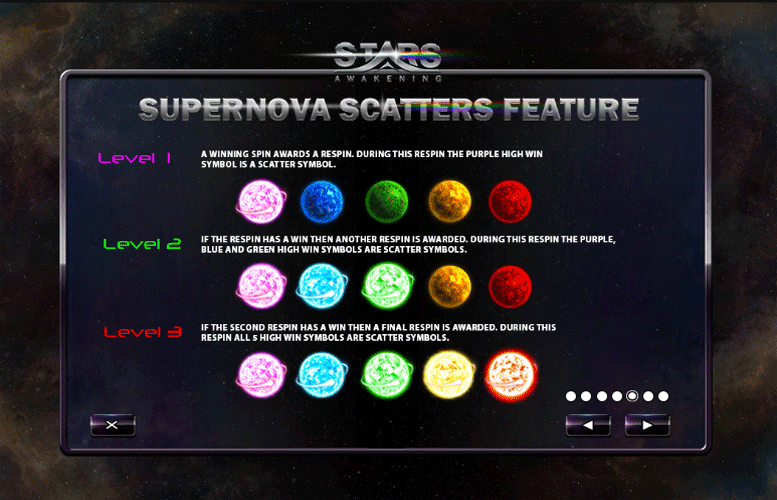 During this re-spin the purple, blue, and green planet symbols are replaced by “scatter” symbols. Level Three = If the second re-spin results in a win for the player, then a final re-spin is awarded. 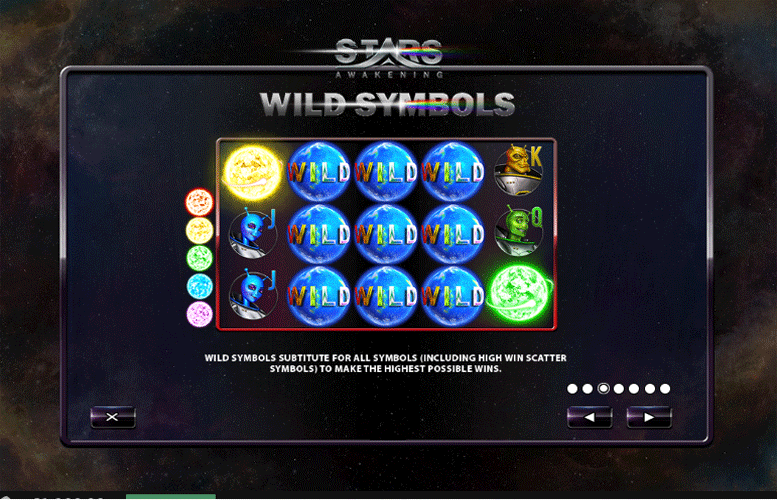 During this re-spin, all five high value planet symbols are replaced by “scatter” symbols. Any high win “scatter” symbol present on three, four, or five reels pays its pay table value multiplied by each number of times the symbol appears on each reel. Ace, or King = 50x the line bet. Queen, Jack, or 10 = 30x the line bet. The number of win lines is fixed on Stars Awakening at 20. This means that players can only alter the option for the total bet size. Here, the lowest figure per spin is just 20p (equivalent of 1p bet per win line). Meanwhile, the upper betting limit is a whopping £100 per line. This works out at a cost of £2,000 per spin. This makes Stars Awakening a great machine to play if you’re wanting to seriously splash some cash. When all is considered, the Stars Awakening slot machine from Playtech just isn’t that exciting. It has a solid look and feel, yet it fails to deliver in the features department. Without any free spins, progressive jackpots, or even an instant cash win bonus, it falls short when it comes to gameplay. That being said, it does offer a remarkably high upper betting limit. This makes it ideal for high rollers. If you were hoping to wage up to and including £2,000 per spin and have a penchant for sci-fi-themed games, Stars Awakening might be just right for you.